Snake River Farms is a meat delivery service that provides the highest-quality pork and beef featured in numerous Michelin-starred restaurants. It is a part of Agri Beef, an Idaho-based company with a tradition spanning 5 decades. Best known for its gorgeous selection of beef cuts that far exceed the highest USDA Prime standard, Snake River Farms is a perfect choice for meat lovers who settle for nothing but the best. Keep reading our Snake River Farms review to discover why this meat delivery service is so well-loved by meat connoisseurs across America. Whether you are looking for a great gift for a carnivorous friend or want to treat yourself to some premium-quality beef or pork, Snake River Farms has got you covered. It is not a subscription-based service, which means that you can shop whenever you feel like it, with no commitments or contracts of any kind. You simply browse the products on offer, pop your favorites into the cart, decide on the quantity, proceed to checkout, and wait for the perfectly marbled deliciousness to arrive. 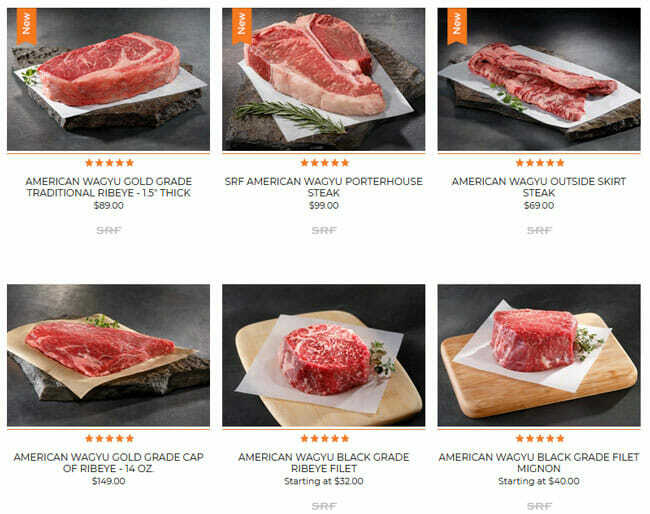 There are more than 150 items available, including American Wagyu, Northwest, and dry-aged beef, Kurobuta pork equal in status to Kobe beef, BBQ cuts, and specials, as well as a variety of gift packs. Everything is neatly categorized, so you can quickly find what you are seeking. There are no limitations in terms of how much meat you can order. With no minimum order value, you can satisfy your cravings without being forced to purchase more meat than you actually need. Plus, shipping is not cost-prohibitive, so there is no reason why you could not purchase as much (or as little) meat as you want as often as you wish. 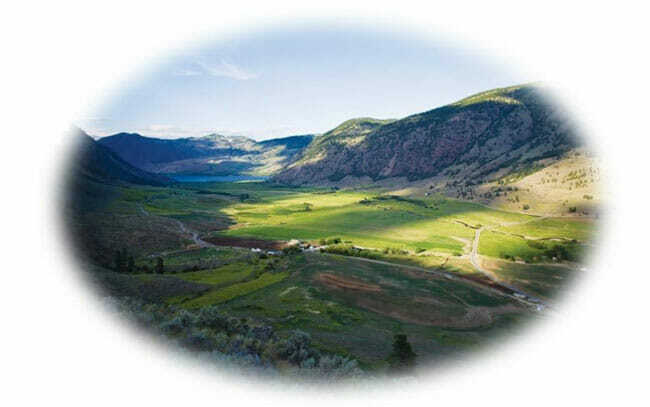 There are two main distinctive features that make Snake River Farms superior to the majority of its competitors. One is the extraordinary quality of its meat and the other is its farm-to-table approach. As we mentioned previously in this Snake River Farms review, the company exclusively provides the best meat available. Its meat comes from the highest-quality Wagyu/Angus cattle and Berkshire hogs that are fed nutritionally balanced diets including forages, grains, and local renewable feeds, such as potatoes. The food safety practices applied are of the highest level and the company has received certifications through both the USDA (United States Department of Agriculture) and the GFSI (Global Food Safety Initiative). The meat is processed in facilities that are USDA, ISO, and HACCP certified. To ensure that the meat it provides is of the highest quality and handled in accordance with the highest food safety standards every step of the way, Snake River Farms leaves nothing to chance and remains involved in every part of the meat’s lifecycle, from farm to table. It takes care of ranching, feeding, processing, marketing, and sales, so you are not dealing with resellers but are instead purchasing meat from experts who care about the well-being of the animals they raise and the happiness and satisfaction of the customers they serve. 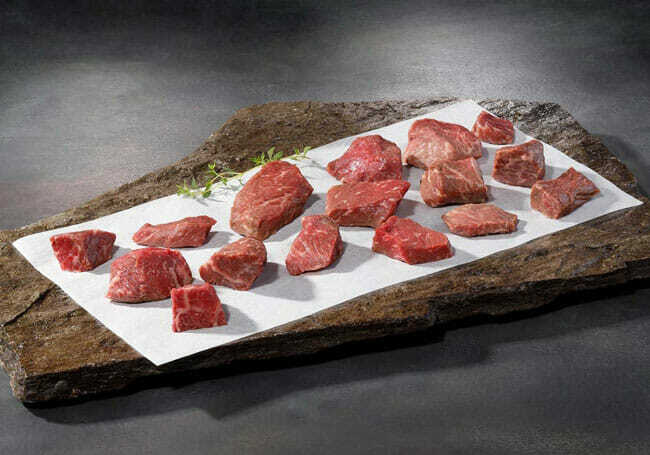 Thus, the company delivers meat products of unrivaled quality. Snake River Farms is the place to go if you want to get a perfect piece of meat for that special dinner you have been planning. However, its store is also chock-full of amazing gifts that are sure to delight anyone who enjoys a good steak. Its selection includes business, special occasion, thank-you, grilling, and just-because gifts and you can always check out the best seller and biggest savings sections to see what is popular and save some cash along the way. Finally, it is good to know that Snake River Farms products come with a happiness guarantee. That means that if you receive damaged goods or products that do not meet the company’s standards related to quality, conditions, and product size, you can get in touch with the support staff within 30 days of receipt and receive a replacement or a refund. We have already stated in this Snake River Farms review that the company’s offer is immense, including more than 150 tempting cuts. Since we cannot list all of its products here one by one, we will simply provide a general overview of the meat options on offer. The meat can be divided into 6 major categories. You can opt for American Wagyu, Kurobuta pork, Northwest beef, BBQ, specials, and dry-aged beef. In the Wagyu section, there are more than 60 delicious items used by award-winning chefs. You can purchase steaks, roasts, briskets, burgers, dogs, ribs, gold-grade Wagyu with the highest level of marbling, as well as specialty items, such as black-grade culotte. Kurobuta pork is of exceptional quality and flavor, as it only comes from 100% purebred Berkshire hogs. Snake River Farms features about 20 items in its Kurobuta pork section, including chops, gourmet ham, ribs, roasts, hardwood smoked bacon, and specialty items, such as Kurobuta crown roast or prime rib of pork. Straight from the heart of the Northwest comes premium-quality beef, tender and robust in flavor. You can choose from nearly 50 options, including steaks, roasts, Prime, briskets, ribs, burgers and dogs, and specialty items like tenderloin medallions. In the BBQ section, you can find about 40 grill-friendly cuts of American Wagyu, Northwest beef, and Kurobuta pork. 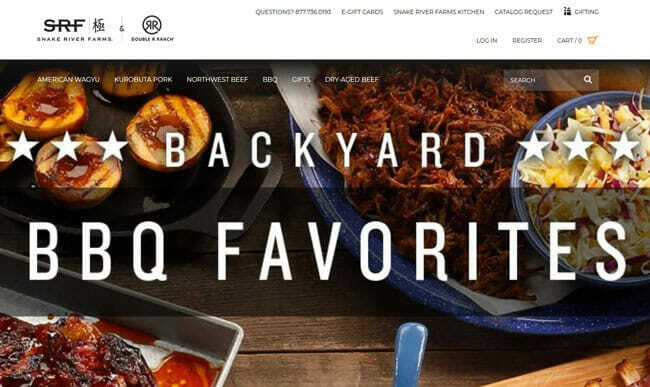 You can check out the Competitive BBQ sub-section for some world-famous briskets or find everything you need to impress your family and friends in the Backyard BBQ sub-section. The Specials category includes just around 10 special items. These include delights like American Wagyu black-grade flank steak, whole tenderloin roast, premium ground beef, Kurobuta spare ribs, and more. Recently added to the company’s selection is dry-aged American Wagyu and USDA Prime beef, rich in both flavor and texture. Brought to you in partnership with the famous Prime Food Distributor, this dry-aged beef is like no other and guarantees a unique eating experience. Snake River Farms products are individually priced and generally do not come cheap. However, the company has made sure its selection includes items that suit virtually any budget. You can get 5 lbs. of delicious hot dogs for $49 or a 2-lb. pack of Kurobuta spare ribs for just $23. On the other hand, you splurge on the Gold Standard maxi-pack that costs $999 and features the finest American Wagyu gold-grade cuts including prime rib roast, cap of ribeye, filet mignon, Manhattan filet, and ribeye filet, 6-8 lbs. each. Unfortunately, shipping does not come free of charge. Shipping costs range from just $9.99 to $79.99, depending on the shipping option you choose. Snake River Farms’ delivery map includes all 50 US states. The company does not ship to Puerto Rico, Guam, and other US territories. It is also worth noting that it does not deliver to PO and APO/FPO boxes. Orders are shipped via UPS and FedEx and normally arrive within 1-3 business days. Shipping options include standard shipping, express shipping, and overnight shipping. Saturday shipping is available with an additional $15 fee. To make sure Snake River Farms meets all your standards and expectations, it is important to know its biggest advantages and disadvantages. With a short overview of its pros and cons, you can easily decide if Snake River Farms is the right company for you. We can conclude this Snake River Farms review by saying that this company’s beef and pork truly guarantee a perfect home dining experience. The meat is as good as it gets, meeting and exceeding the highest standards of quality. You have a vast range of options to choose from and even if you are not willing to spend too much, you can easily find something that suits both your taste and your budget. Plus, the company’s selection of meat gifts is more than impressive, so you never have to spend too much time looking for the perfect gifts for your meat-loving friends. Our ratings are the result of an objective and independent evaluation of Snake River Farms, generating the final rating that reflects the overall quality of the company. Ratings may change as the service changes. Snake River Farms customer rating based on 2 customer reviews. We found 0 verified Snake River Farms discounts for April, 2019. If you like Snake River Farms but aren’t sure whether they are truly the ideal choice for you, you may want to take a look at our comparisons below to discover if one of their competitors is more suitable for you.